The first device in the pro and prosumer line will be the TRINITY Microphone Preamp. This device is of course based on our new distortion free gain stage. The architecture of this ultra linear Mic preamp consists of two ultra linear, low-noise, balanced gain stages and an output attenuator per channel. The final device will have two identical channels. The picture above shows one channel with the power supply board and the front PCB for the rotary control switches and VU meter. Like in the Golden Reference Edition, the PCB of the gain stage is an 8-layers PCB, with IPC 4761 Typ VII: Filled & Capped Vias. The left assembled rotary switch is the On/Off switch and the mode select switch for both channels. The gain of each gain stage can be adjusted in eight 6dB steps, which results in 48dB gain per stage. Overall we have 96dB gain for low level ribbon microphones. An additional balanced output attenuator with seven 1dB steps allows an overall output level control in 1dB steps. The architecture of this balanced double terminated attenuator is based on the attenuator design used in our preamp. Of course we have implemented a very high accurate VU meter with 10 different coloured (green, yellow and red) LEDs, which indicates the output level in the standard range from -20dBu…0dBu…+3dBu. 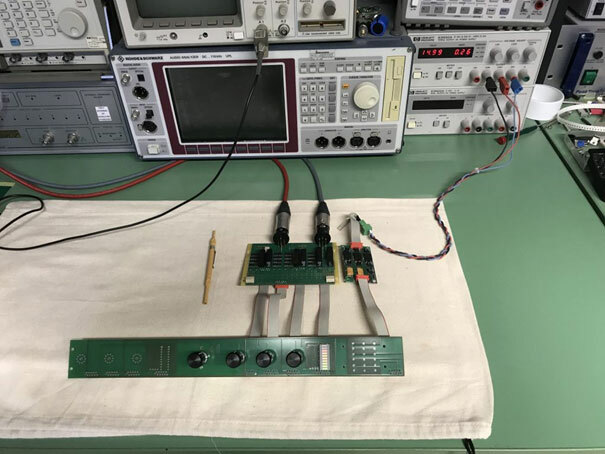 Between the two gain stages we can also assemble two different equalizer networks, so that this microphone preamp can also be used as NAB head amplifier. 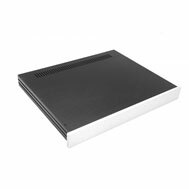 Since the pro and prosumer market is very price sensitive we will use a nice looking 19” enclosure, with a faceplate of 500 x 450 x 10mm.